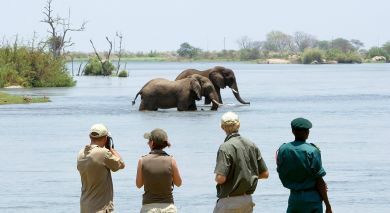 Thawale Lodge is located within Majete, in the backdrop of a serene floodlit waterhole that attracts plenty of wildlife. Six beautifully decorated chalets with showers, twin or double beds, baths, toilets, and a view of the spectacular watering hole from the private verandah, are a perfect to kick off your African bush experience. Tickle your taste buds with fresh meals served in the beautiful thatched restaurant, or sip a delicious cocktail at the bar with a birding veranda. Explore the beauty on boat cruises along the Shire River or get close to the Big Five on game drives. Enjoy dinner under the stars in a boma, entertainment from local Gule wa Mkulu dancers — there are many ways to make your trip wildly memorable!